Talk to a personal interpreter by phone at your convenience, 24/7 in just 3 easy steps. Call from any phone through local numbers in 20+ countries worldwide. Professional interpreters will service English to over 170 languages. 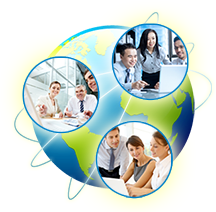 Enjoy the services of professional interpreters and pay by the minute. Enter your 10-digit Pin or call from a registered phone number (Pinless). Press "1" for Spanish, or "2" for any other language; when prompted, say the name of the language (If you need assistance, press "0" or stay on the line to speak with a representative). Follow the automated instructions and press the number that corresponds to your requested language. Once the interpreter is connected, brief him or her on what you wish to accomplish and give them any special instruction. Note: When placing a call to a non-English speaker, begin at Step 2. If you need assistance placing a call to a non-English speaker, please inform the interpreter of that fact before calling the third party. Say "END OF CALL" to the Interpreter when the call is completed. Place the other party on conference hold and dial 1-800-497-8308. Using three-way calling, connect the interpreter and the non-English speaker to begin your conversation. Follow the automated instructions, pressing the number that corresponds to your requested language. When the interpreter is connected, you can use the speakerphone, or pass your handset back and forth, to continue the conversation. After you are connected, give the interpreter your name and the non-English speaker's name. The interpreter is only allowed to give you their own name.